"You don't seem very happy to see me, Roy", June Havens (Cameron Diaz) whisper-yells to dashing Roy Miller (Tom Cruise) from across a sun-drenched, tile-studded pavilion, gunshots ricocheting left and right around them. In the middle of this firefight, Roy stops, takes his sunglasses off in a cavalier David Caruso fashion, walks clear across the path of fire without so much as a graze and looks her dead in the eyes while saying, "I am happy". That's James Mangold's Knight and Day, a bombastic yet ruthlessly doltish action-comedy-romance hybrid that unflinchingly turns its shoulder from practicality. It exists in that magical space where heroes aren't hit by bullets unless the film needs a beat and where flipping airborne cars come millimeters from knocking someone's head off, all for stabs at excitement. That world can be a fun vacation spot, but not with this rickety itinerary or with Diaz as the tour guide. At least Tom Cruise attempts a tried-and-true effort to make it exciting, though. Cruise plays Roy, the quintessential dashing superspy that'd make Ethan Hunt look like a pansy, who happens to bump into classic car restoration guru June at the airport -- a fabricated meet-cute. After they end up on the same flight together and share a few sparks, and Roy takes out an entire jet full of counter-spies, she ends up irrevocably linked to him. June soon learns, though, that Roy's hunted by the American government in connection with his link to the Zephyr, a portable device that could change the face of the world (I know, I know). It takes a little convincing on Roy's part to keep her around, ensuring that she'll be killed if she leaves his side, but she shakily follows him on a high-paced trek that skips the pair haphazardly from Wichita, Kansas to an off-the-grid island paradise and then to the expanses of Austria and Spain within just a few days. But the CIA, led by spearhead Fitzgerald (Peter Sarsgaard), are close behind, as are others interested in the device Roy's carrying. Similarly to True Lies and Charade, Knight and Day cooks up a bouillabaisse of flippant humor and fast-paced action, brought to a simmer by the timid chemistry between a roguish uber-spy and his mousy, virginal companion, who's actually the story's focus. In theory, Cameron Diaz and Tom Cruise could easily play up this angle by tapping into their mostly-successful contrasting dynamic from Vanilla Sky. Problem is, however, that this product-and-star-friendly script reeks of either formula or hackneyed spins on the formula, splicing in cringe-worthy lines, ludicrous plot movement, and strenuous death-defying within the not-so-charming absurdity. Some will argue that surrendering to its capriciousness is the ante one pays to indulge in an adrenaline-fueled popcorn experience, but director Mangold doesn't make that process very easy when this template-assembled action film ignores common sense to such a high-handed and persistent degree. 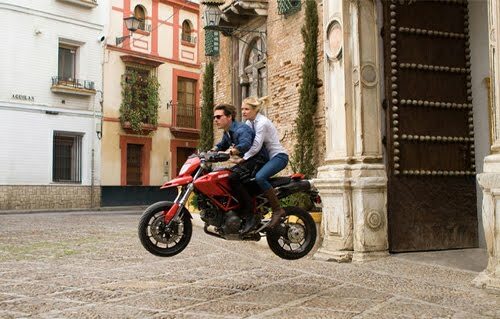 As the mundanely-shot Knight and Day lavishly explodes, revs, and jets across the world, often occurring in erratic (drug-induced) gaps in time off-screen, Mangold has to rely on Cruise and Diaz's charms individually to drive the picture. Cruise is up to the task, but in a different fashion than expected; instead of his brash, overly twitch persona with lots of abrasive verbal lashings, he commands Roy Miller as a collected and suavely-physical spy. And, when he's delivering the lines in such a cool manner, his underappreciated comedic delivery really shines. Cameron Diaz, on the other hand, drags him down and shows a lack of ability to captivate her audience, coming across as uninterestingly naïve and bird-brained as poor decision-maker June (really, June, stay where you are). It's interesting to watch the two back-and-forth, because the same level of misfired quality can be seen in their parts -- and Cruise makes lemonade, while Diaz sours early on. Sure, Knight and Day captures plenty of boisterous action in exotic and appealing locales, pumping a level of octane into Roy's scramble from the authorities and globe-stretching villains, and it's made mildly intriguing on a mental level by Cruise's witty depiction of an unpredictable rogue agent with undefined motives. Can you kick back and let him lug the tongue-and-cheek flow through zipping motorcycles, a rooftop chase a la To Catch a Thief, and train-laden brawls? Perhaps, but its defiance in the face of logic becomes more and more infuriating as time progresses, revealing a lack of polish that the likes of this year's Salt had shimmering on its unbelievable surface. Some might see Mangold's summertime film as a piece of work that doesn't take itself too seriously, a frivolous little firecracker that pops and sparks for simple amusement, but all these eyes see is bold, inane tomfoolery that doesn't make one all that happy to see it.